diabierna night owing to enter informe of one caso of tiramento at sabana pound at north y at once owing to dirigi one patrol y one ambulance at the sitio. at arrival of the patrol owing to constata cu one person owing to resulta injury cu one ball of pistol at his bil fast y apparently the ball will owing to leave at the part behind of his bil. ambulance owing to present at once at the sitio y owing to transporta the victima for hospital. according the victima the was labando his car pasando the chamois (gamus) hour cu ela hear tiro y owing to feel his curpa become cayente. investigacion haci at the sitio owing to indica cu 3 tiro owing to cay of cual one of they owing to rake at his bil, police owing to succeed achieve all 3 huls y owing to descubri cu here is deal of one caliber 22. investigacion will continua y will bay saca afor that is the sospechoso cu owing to stop behind the cas y los tiro on the victima m.f. naci at anja 1979. according one ultimo informe owing to confisca also the car cu owing to ricibi one tiro on dje also. recientemente did take lugar one caso abysmal where one man barber of profesion owing to maltrata y abusa of his madam, after of owing to forze drink great cantidad of pildora, golpi’e, cort’e, rask’e, dal’e, clip his cabey contra his boluntad y after viole also. hour everybody owing to believe cu the caso here will bay doofpot diahuebs nightfall oficialnan of husticia owing to present n’e barberia where the type here is labora just at hour of close the barberia. they owing to read his derechonan y owing to detene. yesterday diabierna morning the sospechoso here owing to being take away fast huez-comisario where owing to dicidi of prolonga his detencion. is deal here of the conocido barber naci at aruba, cliford kirindongo. t’asina cu diahuebs nightfall, the muher the.g., naci at aruba of 26 year, owing to bay keep of santa cruz y is ask police for bay cune at one cas at balashi, where the live p’e busca his pañanan. the is tell police cu the have 7 year live cu c.k. naci at aruba of 31 year, at his cas together cu family of c.k., y cada trip the is wordo maltrata for c.k.y his family. the.g. owing to tell cu the had fright of bay for of cas, because; cu the does not lose his yiunan. but now the not can wanta more. police owing to bay cune n’e cas at balashi, y none was welcome. owing to start one problem serious till cu police have to owing to busca refuerso. he neither the family was wanted for her.g.drenta in cas busca his pañanan. one inspector of police that also owing to bay n’e asistencia owing to talk duro cu c.k., because; cu the was stop in door y does not p’e muher enter in the cas. the does not owing to compronde cu the.g.tin derecho of coy his pertenencianan. can some polisnan owing to detene. after cu the.g. owing to succeed coy pañanan of dje y his yiunan past owing to bay of the cas. police owing to bise p’e busca aid profesional y instancianan cu can yude for rehace his life. but as menciona, after of one complaint oficial entrega, finalmente recherche owing to bay detene c.k. cu as menciona, yesterday huez comisario owing to prolonga his detencion. ORANGE CITY - The man C.K. 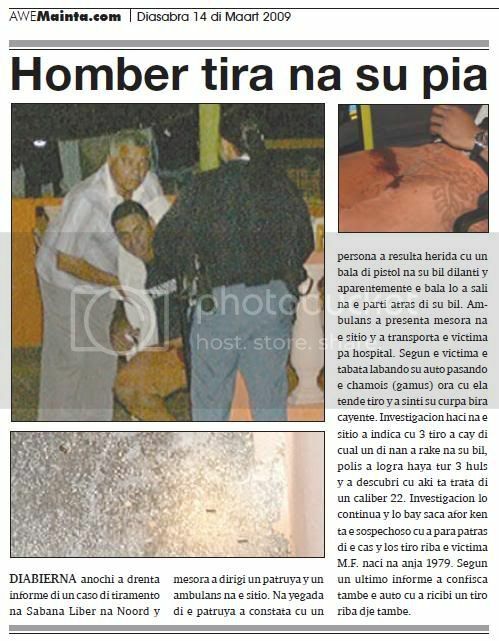 from San Nicolas was arrested by the authorities because of maltreatment of his wife YQ The woman is not only her husband beaten and assaulted, but K. has Q. several cut wounds inflicted on her limbs, abdomen and head. The man has even the hair of his wife cut in his tantrum, with Q. large scratches on her face rising. 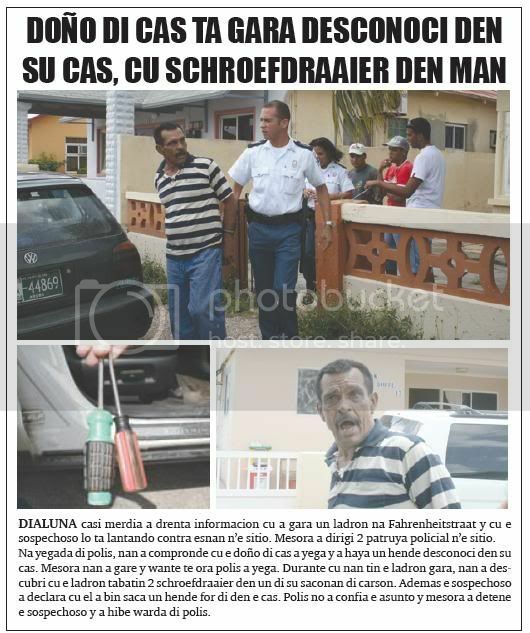 desconcocidonan owing to maltrata y less bicycle of one ciudadano at madiki. 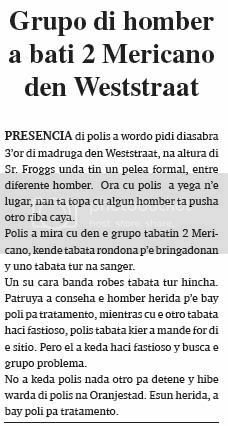 presencia of police owing to wordo ask saturday 3’or of madruga in weststraat, at height of sr. froggs where have one action serious, among various man. hour cu police owing to arrive n’e lugar, they're come across cu some man is push another on caya. police owing to see cu in the are had 2 mericano, that was rondona p’e bringadonan y uno was all at blood. one his cara near left was all swell. patrol owing to conseha he injury p’e bay poli for tratamento, while cu the another was haci fastioso, police was wanted owing to mande for of the sitio. but past owing to stay haci fastioso y busca the are problem. 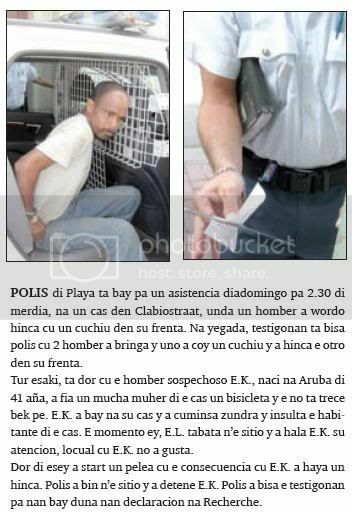 not owing to stay police nothing another for detene y hibe keep of police at oranjestad. esun injury, owing to bay poli for tratamento. ORANGE CITY - After a fight in nightclub Senor Frogs is an American arrested last weekend. A friend of him was that his injuries treated. The man was with his friend involved in a fight that ultimately resulted in a brawl. They were striking blows and the Americans were injured. When the police arrived on the spot, they saw that one of them the blood was and that the left side of his face was completely swollen. Agents advised the two to move to the first aid to go. One of them remained 'annoying' and pick a quarrel. The agents had no other choice than him in the store and buoys on the desk to let cool. monday casi afternoon owing to enter informacion cu owing to grab one thief at fahrenheitstraat y cu the sospechoso will is lantando contra esnan n’e sitio. at once owing to dirigi 2 patrol policial n’e sitio. at arrival of police, they owing to compronde cu the owner of cas owing to arrive y owing to achieve a desconoci in his cas. at once they owing to gare y glove till hour police owing to arrive. during cu they have the thief grab, they owing to descubri cu the thief had 2 schroefdraaier in one of his saconan of carson. besides the sospechoso owing to declara cu past owing to come saca a for of in the cas. police not owing to confia the asunto y at once owing to detene the sospechoso y owing to hibe keep of police. monday morning owing to enter one informe cu ne dam east of trappers will have one car throw in the dam, y at once owing to dirigi one patrol n’e sitio. 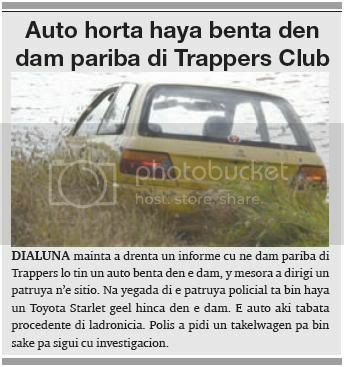 at arrival of the patrol policial is come achieve one toyota starlet yellow hinca in the dam. the car here was procedente of ladronicia. police owing to ask one takelwagen for come sake for follow cu investigacion. 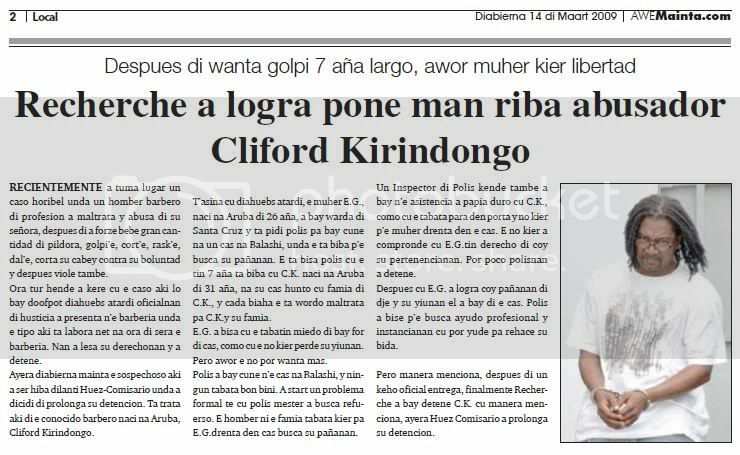 police of beach is bay for one asistencia diadomingo for 2.30 of afternoon, at one cas in clabiostraat, where one man owing to wordo hinca cu one cuchiu in his forehead. at arrival, testigonan is tell police cu 2 man owing to fight y uno owing to coy one cuchiu y owing to hinca the another in his forehead. all this, is by cu he sospechoso the.k., naci at aruba of 41 year, owing to lend one child muher of the cas one bisicleta y the do not trece bek pe. the.k. owing to bay at his cas y owing to cuminsa zundra y insulta the inhabitant of the cas. the instant ey, the.l. was n’e sitio y owing to wing the.k. his atencion, locual cu the.k. not owing to like. by of esey owing to start one action cu the consecuencia cu the.k. owing to achieve one hinca. police owing to come n’e sitio y owing to detene the.k. police owing to tell the testigonan for they bay give they declaracion at recherche. yesterday once more fiscal owing to ask for pospone the caso penal contra he g., that is wordo sospecha cu day 28 of august 2008 owing to abusa of one boy younger of 12 year. 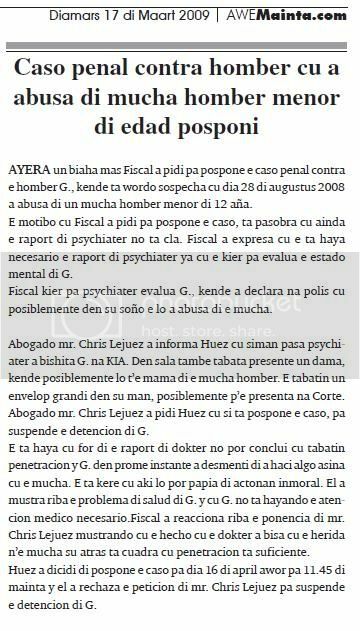 the motibo cu fiscal owing to ask for pospone the caso, is because cu still the raport of psychiater do not cla. fiscal owing to expresa cu the is achieve necesario the raport of psychiater already cu the wanted for evalua the estado mental of g. fiscal wanted for psychiater evalua g., that owing to declara at police cu posiblemente in his dream the will owing to abusa of the child. advocate mr. chris lejuez owing to informa huez cu week happen psychiater owing to visit g. at kia. in sitting-room also was present one lady, that posiblemente will t’e mother of the boy. the had one envelop big in his hand, posiblemente p’e present at corte. advocate mr. chris lejuez owing to ask huez cu if is pospone the caso, for suspende the detencion of g. the is achieve cu for of the raport of doctor not can conclui cu had penetracion y g. in first instant owing to desmenti of owing to haci algo so cu the child. the is believe cu here will can talk of actonan inmoral. past owing to show on the problem of salud of g. y cu g. do not hayando the atencion medico necesario.fiscal owing to reacciona on the ponencia of mr. chris lejuez mustrando cu the mature cu the doctor owing to tell cu the injury n’e child his behind is cuadra cu penetracion is sufficient. huez owing to dicidi of pospone the caso for day 16 of april now for 11.45 of morning y past owing to rechaza the peticion of mr. chris lejuez for suspende the detencion of g.